Our research centres around the theme of quantifying the response of glacierised regions to climatic change, considering both contemporary and palaeo-environments. We focus on Arctic, Antarctic and Alpine environments and use a range of methods, in particular field data collection, remote sensing and GIS, numerical modelling and geomorphological mapping, to establish the key drivers of cryospheric change and measure rates of response. Our aim is to project the evolution of glacierised environments in future decades. 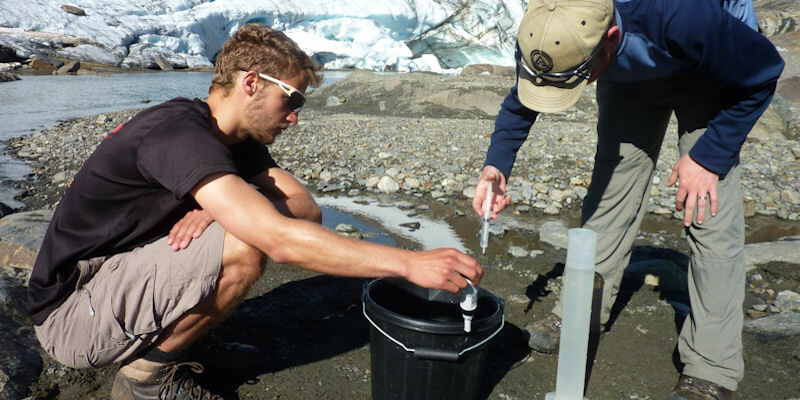 A key part of our work is establishing the impacts of these changes on downstream users and ecosystems as the supply of glacial meltwater becomes increasingly variable. Glacier dynamics: We have ongoing work in Arctic Sweden, Greenland, the Himalaya and New Zealand focusing on broad-scale changes in glacier dynamics – specifically changes in mass balance, surface velocity, and glacier-lake interactions. We use field-based methods to quantify rates of accumulation and ablation as well as glacier surface elevation changes. Coupling these measurements with remotely sensed and modelled datasets, we are able to extrapolate our work across wider areas. We have ongoing work to forecast the response of debris-covered glaciers at high-elevation sites, to model the response of New Zealand glaciers to large proglacial lake development at the end of the Last Glacial Maximum, and to reconstruct the past dynamics of the Antarctic Peninsula. Glacial landforms: We study all scales of glacial landforms as indicators of past glacial behaviour as well as informing contemporary process-based research. We work at the field scale to interpret sedimentary deposits and proglacial geomorphology to reconstruct the rates and dynamics of previous glacier recession, for example, through to reconstructing former ice limits using remote sensing and digital elevation data. Recent highlights include quantifying the rates of change of glacier surface landforms, e.g. ponds and cliffs, to better understand the processes driving melt on debris-covered glaciers, and quantifying rates of previous glacier recession for benchmark glaciers in the Austrian Alps. Outburst floods: The number and size of glacial lakes is increasing in most glacierised areas of the world, and one of our research priorities is to establish the magnitude and frequency of past events as well as the likely impact of future events. To do this we use a combination of field observations and numerical modelling, and digital elevation data most frequently derived from satellite imagery. We simulate outbursts from different glacial environments and catastrophic floods from moraine failures, using 1D, 2D and 3D approaches depending on the context. We also have expertise in Structure-from-Motion, drones and surveying to be able to extract our own topographic datasets that allow us to be able to study sediment transport and erosion during flood events at very fine resolution. Surface energy balance modelling: Our researchers use a range of numerical models to forecast glacier response given changes in climate. We use degree-day, temperature index and full physical energy balance approaches and apply our models to both clean-ice and debris-covered glacial environments. As well as model development, our work focuses on improving the models input variables. We have a strong interest in measuring surface roughness and establishing its evolution through both space and time. This work has been conducted in Patagonia, the Himalaya, Arctic Sweden and the European Alps.